Kurt and I managed to get on the road about noon, deciding to hold off on lunch for a bit since there just wasn’t around our motel (we were completely out of the city). We traveled West through the desert to Yuma, AZ. There really wasn’t much at all to speak of: sand, low mountains, a few saguaro cacti and other tough looking foliage. Kurt and I pulled into Yuma about three hours after leaving Casa Grande and found a place for lunch. Of course I voted on Mexican food, and La Flor fit the bill perfectly; it was a small authentic Mexican diner. I had my standard cheese enchilada, taco, rice and beans. Kurt, however, decided to get daring. He ordered tripe from the waitress, which evidently shocked her. With an uncertain look, she asked in her best English, “You do know what that is, don’t you?” (of course he did…). Kurt had actually never had tripe before, but he wasn’t all that impressed. He said he doesn’t think he’ll order it again, mentioning it was a little too oily. Oh yeah, of course he made me try it, too. I wasn’t impressed either – it was a little too chewy for my taste. Once we finished eating we headed for California. As soon as we crossed the border, we had to stop at an official checkpoint. I remembered visiting California as a kid and passing through such check points at the border. Back then they were looking for fruit (it was during the ‘fruit fly epidemic’ if you will allow me to use that phrase) and made us discard all fruits and vegetables in the car. Oddly enough, this time they only asked us where we were coming from (we didn’t know exactly how to answer that) and to have a nice day. We assumed they were probably looking for illegal immigrants, judging from the Border Patrol trucks we saw. 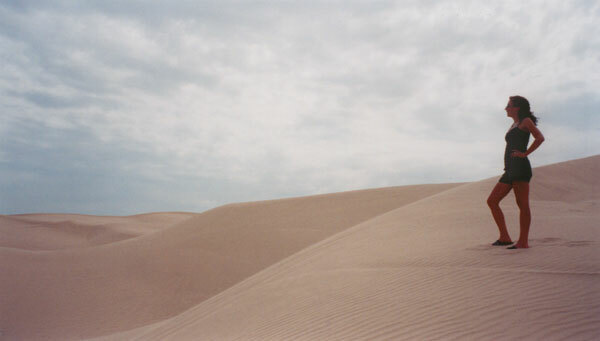 Fifteen miles past the checkpoint, Kurt and I stopped to check out the Imperial Sand Dunes. They were amazing, exactly what you would picture when you think of Egypt or the Sahara Desert. We walked a short distance from the car (over a few dunes) then decided we had better turn around before we got lost. The next stop was Calexico, California, which bordered Mexicali, Mexico - confused yet? We stopped at a Wal-Mart in Calexico to buy some film and found it was very different as most of the signs were in Spanish and many of the products were definitely not sold at the store in Manhattan. The clerk checking us out also attempted to address us in Spanish at first. Once we picked up the film we made a run for the border. 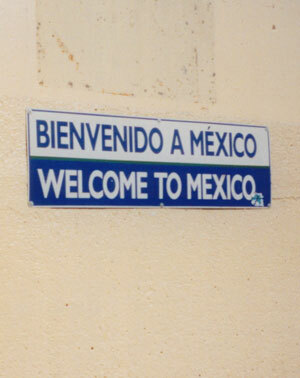 Getting into Mexico was quite easy - we parked on the U.S. side and simply walked across the border through a turnstile, no questions asked. We wandered up and down a few of the streets near the crossing and shot a couple of pictures. There were a lot of people just loitering around, watching us, which made us a little nervous. It definitely was not a tourist town; there were only a couple of street vendors catering to what tourists there were (Kurt and I were about the only ones). We decided 30 minutes was enough time ‘on the other side’ and headed back to the border, hoping our driver’s license was really all we needed to return to the US. We had to wait in a short line before showing our ID’s to the Border Officer. He of course made the standard, “You’re not in Kansas anymore” joke. We thought humoring him would be in our best interest, so we acted as though we had never heard it before. Either a driver’s license was really all you needed, or our good humor worked because we were back in the US in no time. Thankfully, our car was right where we left it, too. Amazing. We were worried because we saw a number of very nice, new vehicles in Mexico missing license plates. Seemed fishy to us. Kurt and I decided to head North for a while and check out the Salton Sea. We started along the west coast of the Sea when we noticed a sign for Oceanside. Hmm, that sounded like fun. Why not? We had two days left and Kurt had never been to the Pacific. The drive to Oceanside was beautiful; we quickly left the desert and headed into the mountains where the foliage changed dramatically. The air became much thicker with humidity and all at once everything was green. It was so beautiful and picturesque, such a wonderful change from the desert we had been exploring for the last week. We continued on through the mountain roads (Kurt was very gentle with the rental car on the mountain roads, of course! ), admiring the views as we went. Eventually we reached the town of Oceanside, California. We had called ahead and found a Motel 6 with rooms available for the night – that trusty Motel 6 again. We found the motel without any troubles then continued our trek West until we ran into the ocean. We drove North along the coast, listening to the waves crash on the shore and admiring the picture-perfect seaside bungalows until we reached a public pier surrounded by several restaurants. We chose a restaurant called Monterrey Bay Cannery. I had fresh Monkfish with pasta accompanied by a glass of wine. Kurt had a fresh tuna steak and an Anchor Steam on tap.